Woven Copper Mesh is similar to a cloth with wire threads woven at right angles. Our plain weave copper cloth is flimsy and easy to cut by common scissors. It has an unpolished surface. Confirming to ASTM E2016-06. Apart from high conductivity, nonmagnetic feature and corrosive resistance, copper cloth is also easy to be welded to form a rigid sheet with uniform opening size. With opening size from 0.006 inch to 0.075inch, copper cloth is very usable as a strainer or a sieve. Application: RFI shielding, Faraday cages, Tempest shileding etc. Advantages:Non-magnetic, anti-sparking and resistant to atmospherice corrosion, salt air and brine. Soft, easy to cut or soldered. copper mesh always used for shielding room construction together with copper foil opper wire mesh: Red copper wire. (Pure copper 99.5%). Non magnetic, wear-resistant, filtration of electron beam. In general, some secret area and room will be made of red copper mesh made of shielding chamber or directly to the copper network with cement touch in the wall to play the shielding effect. We can offer different mesh number from 16 mesh to 200 mesh, and it is with relevant wire diameter. In usual, 16 mesh number 0.27mm wire diameter, 1m width and 30m length is our common size, however, we can also offer other width according to our customer requirment, max width is 1.8m. 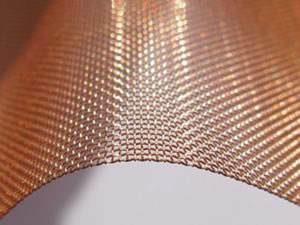 Looking for ideal Emf Rf Shielding Copper Wire Mesh Manufacturer & supplier ? We have a wide selection at great prices to help you get creative. 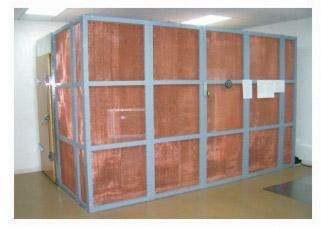 All the Faraday Cage Screen Room Shielding Copper are quality guaranteed. We are China Origin Factory of Emi Rf Copper Shielding Mesh. If you have any question, please feel free to contact us.